Finally! Yoga Accessories customers can purchase just the cover for our best selling Supportive Round Yoga Bolster. Now you can reinvigorate your existing bolster with a fresh face! A new cover is a great way to increase bolster life span or accommodate a change in studio color schemes. Each cover is just like the original: 100% cotton, same great color options, has handles on both ends, and features a full-length zipper for easy batting removal or replacement. Good quality and well-made. These should last for quite a long time. I only gave it 4 stars because the covers is too large for the round cushions on my futon, but they're the best I could find after searching for several days. That's my only issue with them. I guess they're made for different applications. Great quality, beautiful colors. I can't believe how quickly my orders come from Yoga Accessories. Thanks! I purchased the Round Cotton Yoga Bolster and I love it! I ordered it in Cardinal Red which (on my computer) appears to be a subdued color but it's actually quite bright red. It was too bright for my decor so I ordered a black cover. I received the black cover promptly and it was easy to switch out with the red cover. 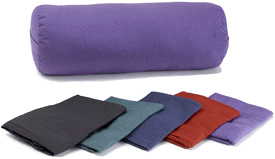 My bolster is not only is a great yoga tool but it's something I don't have to hide! I will be ordering more bolsters for myself and hopefully my students will do the same! i got the firm pillow and wanted a spare cover so i got a black one. like the one that comes with the pillow, these are made of heavy fabric and are well made. they fit very snug on my pillow and i am not sure how well they will age since i have to really put muscle into putting them on and off. so far they are like a tank! I used this to put 4 of the Mexican Yoga Blankets in it to create a bolster. Worked great. Thank you. This bolster cover was better than I expected! It fit my bolster perfectly and it's really good quality. I love that I can take it off and wash it. Really happy with it. And the price was good, too!